One figure for a three- or four-player game. Or 3 figures for a two-player game. One Freight Train with all three types of commodities. Government Contracts, dealt randomly, face down. Each player gets 3 green contracts and 3 blue contracts. Return leftover Contracts and player pieces to the box. You may look at your Government Contracts at any time, but keep them secret from the other players. All other items acquired during the game (guilders, Equipment, Crew, Employees, Canals, Ship Cards) are public and should be kept where the other players can see them. The Game Board comes in two halves. Place the two halves next to each other (either vertically or horizontally) in the middle of the table. 19 Lead Action Card on starting space. Ship Cards should be sorted according to their backs into 4 decks of cards. Shuffle each deck separately. Combine the two decks of middles into one deck by placing the larger deck on top of the smaller. This makes 3 decks of Ship Cards: bows, middles, and sterns. 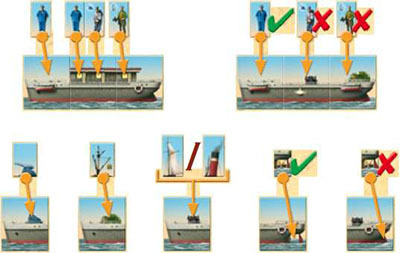 Place each deck of Ship Cards face down on the indicated space. Deal the top 10 cards from the deck of middles face up onto the 10 spaces on the Game Board below the deck. Deal the top 5 cards from the deck of bows face up onto the 5 spaces below the deck. Do the same for the deck of sterns. Shuffle the deck of Freight Trains and place it face down on the indicated space. Deal out the top 5 cards onto the spaces below, just as you did for bows and sterns. Do the same with the deck of Shipping Canals. Each player should place his or her counter on the Scoring Track on the space marked "0". 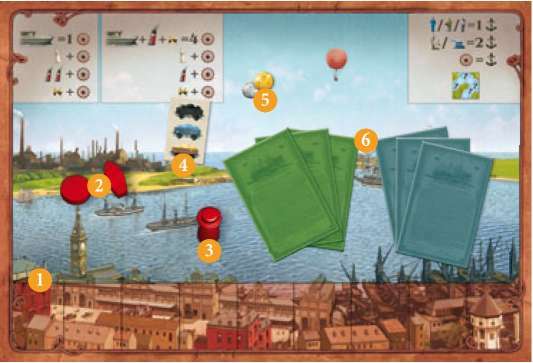 Equipment and Crew pieces should be placed in the bank, on the indicated spaces along the edge of the board. Coins should be placed in the bank in the middle of the Action Track. Action Cards are placed on the Action Track. Those which are illustrated on the track should be placed on the indicated spaces. The Receive Subsidy Action Card is only used in a four-player game. For a two- or three-play- er game, return it to the box. In a four-player game, the Receive Subsidy card goes on the space marked. The remaining Action Cards are placed between marked spaces in random order. The countdown marker is placed on the space of the Countdown Track corresponding to the number of players in the game. The Recruit Crew marker is placed on one of the four sectors of the green circle, chosen at random. Similarly, the Manufacture Equipment marker is placed on a randomly chosen sector of the brown ring. However, the Exchange marker is placed on the designated space in the hexagon. (See illustration). The Hire Employee marker is placed on a randomly chosen space of the purple oval. Separate the Employee Cards into two decks according to their backs. Shuffle the brown deck and deal the cards out randomly around the Employee Track, face up (For your first game, we recommend re-arranging the cards so that each set of three has either a green recruiter or a brown engineer). For a three- or four-player game, turn the other deck of Employee Cards face up, and place each card on top of the brown- backed card that matches it. In a two-player game, only the brown-backed cards are used. Players take turns, beginning with a randomly selected player and continuing around the table clockwise. On your turn, you will choose one of the available actions from the Action Track. The action will get you something you need to help build your ships. On your next turn, you will move that Action Card ahead of all the others and choose a different action. This is explained in detail below. If you complete a ship on your turn, you take it out for a shakedown cruise in the canal, during which you may score points for speed, crew, equipment, or safety. The game ends when the countdown marker reaches the space marked . (It can also end early if you run out of Ship Cards). Bonus points are scored for Government Contracts, and the player with the most points wins. Advance your previous turn's Action Card. Perform your chosen action. (You have the option of paying 6 guilders for one bonus action in this step). If you completed one or more ships, take your new ships out on a Shakedown Cruise. (This is how you score points). 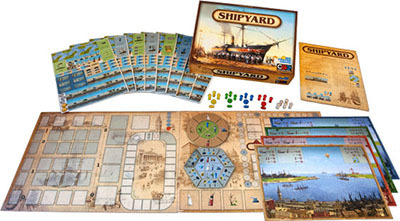 In a three- or four-player game, you begin your turn by picking up your figure and moving its Action Card to the first empty space on the Action Track ahead of all the other cards. In other words, the Action Card you chose the previous turn becomes the new lead Action Card. Special Case: It is possible that your figure was already sitting on the lead Action Card. Even in this case, you need to move the card. Just move it one space ahead. Th is can only happen to the starting player and only on his or her first regular turn. Falling Behind: In rare cases, the last Action Card may fall so far behind that the lead Action Card catches up to it. There should always be at least 1 empty space immediately ahead of the lead Action Card. If the new lead card is placed right behind the last card, move the last card ahead one space. (If that space is occupied, move the card there ahead one space as well, etc). In a two-player game, you advance the card that you chose two turns ago: pick up the card marked by two figures and move it into the first empty space on the Action Track. Place one of the figures next to the figure that remained on an Action Card. You end up with one figure in your hand to use in step 2. Your other two figures are marking your previous turn's action. The action from two turns ago has moved into the lead. You cannot choose the lead Action Card (the one you just moved to the front). The card you choose must not have any figures on it. You must be able to perform the chosen action. Put your figure on the chosen card. Note: In a three- or four-player game, you will have 4 actions to choose from. In a two-player game, you will have 3 to choose from. You get income by choosing an Action Card that no one has chosen for a while. If you place your figure on a card that is ahead of all the other figures, you get no income. Otherwise, you get one guilder for each occupied card that is ahead of the one you chose. If you place your figure on a card that is behind all the other figures, you might also get a bonus for empty spaces. Count the number of empty spaces (those with no Action Cards) between your chosen card and the closest card ahead of it, occupied or not. For every 3 empty spaces, you get one guilder. (Do not round up: for 6 empty spaces, you get two guilders, but for 5 you only get one). You do not get the empty space bonus if any figures are on cards behind yours. Example: If you choose the Rent Canal,, Purchase Commodities,, or Manufacture Equipment actions, you will gain 2 guilders, because two of the cards ahead of them are occupied. Th at is all you get from Manufacture Equipment or Rent Canal, because there are only 1 (2) empty spaces between it and the next card. Purchase Commodities (three empty spaces) would give you a bonus of 1 guilder. Note For A Two-player Game: When calculating income, it is the number of occupied cards that matters. You get 1 guilder per occupied card ahead of yours, not 1 guilder per figure. A card counts as occupied whether it is your figures on it or your opponent's. After receiving any income, you must perform your chosen action. The actions are explained in detail in the next chapter. If you pay 6 guilders, you can also perform a bonus action. Your bonus action can be any other action. You can choose the action that you moved to the front in step 1. You can choose an action that has another player's figure on it. The only action you cannot choose as a bonus is the one you chose in step 2 (the one with your figure on it). You cannot buy more than one bonus action. You do not use a figure to mark your bonus action. Simply announce to the other players what it is, pay 6 guilders, and perform it. You may perform your bonus action either before or after your required action. You pay for your bonus action when you use it. It is not possible to use guilders gained from your bonus action to help pay for itself, but it is possible to use guilders gained from your required action to pay for your bonus action, if your bonus action is performed second. It is possible to buy a bonus action even on your first turn. Note For Two-player Game: Th e only restriction on your bonus action is that it can't be the one you chose this round, the one with 1 figure on it. You can choose the card with 2 figures on it as your bonus action, if you wish. A ship is complete when it has a bow on the left, at least 1 middle piece in the middle, and a stern on the right, with no empty spaces. If you have any ships completed after step 4, they must leave your Shipyard to be tested in your canal system. You will score points for Crew, Equipment, and safety features. The Shakedown Cruise is described in detail in a later chapter. You do not need to complete a ship every turn. If you have no completed ships at the end of step 4, your turn ends without a Shakedown Cruise. 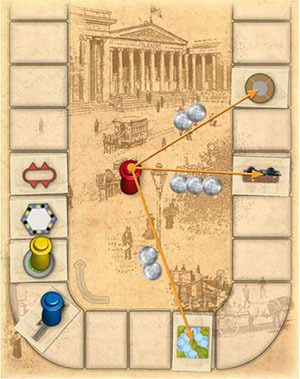 On each player's turn, one of the Action Cards is moved to the front of the line, with the result that the cards move around the Action Track. When the lead card is placed in the starting space again (ie. one space before the darkened space), the Action Cards have made a lap around the track. In a 4-player game, you have three green and three blue contracts. When the countdown marker reaches 2 (halfway through the game) you must give up two of each. In a 3-player game, you have three green and three blue contracts. You must give up one of each at the end of the first and second laps (when the marker is moved to 2 and when it is moved to the unmarked space). In a 2-player game, you have three green and three blue contracts. At the end of the first lap (halfway through the game) you must give up two of each. Reminder: Your Government Contracts are supposed to be kept secret. Do not even reveal those that you discard. In all cases, the result is that you play the final lap with only 2 Government Contracts, one green and one blue. These are the ones that will add in to your final score. Read here the detailed descriptions of the actions. If you complete a ship, then you end your turn with a Shakedown Cruise. Your ship is ready to score points. If you complete multiple ships, then each will have its own Shake- down Cruise. You decide the order in which your ships will be scored. A ship must leave the Shipyard on the turn on which it is completed. A completed ship has a bow on the left, one to seven middles, and a stern on the right. All pieces are adjacent with no empty spaces between them. A ship that is not completed does not leave the Shipyard. Equipment and Crew are not added to your ship until it is complete. Equipment and Crew that are used on one ship will stay with that ship and cannot be used on a different ship later. 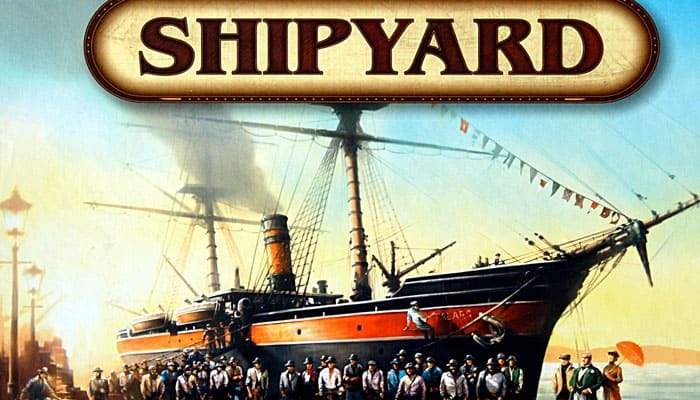 You can only add Equipment and Crew that you have in your Shipyard. You do not get to take pieces from the bank. Attaching these pieces to your completed ship does not require an action. Every ship must have a captain. He does not need a cabin. If you put additional captains on your ship, they become officers, and each one of them needs his own cabin. Each piece of Equipment must have a mounting point. Exception: Certain Employees (builders) allow you to have extra Crew without cabins or extra Equipment without mounting points. Note that propellers, cranes, and cannons each have their own specific mounting point. A crane cannot attach to a cannon mounting point, for example. However, sails and smokestacks use the same type of mounting point, and a cabin can hold any type of Crew. Each mounting point can have only one piece of Equipment. Each cabin can hold only one Crew Member. You do not have to use all the mounting points and cabins on your ship. You can choose to save Equipment and Crew for later. A ship with at least one smokestack and one propeller has a base speed of 4. For each additional smokestack, propeller, or sail, its speed is increased by 1. A ship with no smokestack or no propeller has a base speed of 1. For each sail or propeller, its speed is increased by 1. For each pair of smokestacks, its speed is increased by 1. Your ship must have a captain (but he doesn't need a cabin). Your Canal System must be long enough to allow your ship to move forward at full speed. A ship that fails to meet one or both of these requirements scores no points. You should not give it Equipment or Crew because they will be wasted. The ship does not sail. Instead, it is removed from the game. It will not count toward your Government Contract at the end of the game. Note: A ship with no smokestack, no propeller, and no sail can still be scored as long as it has a captain. It will have a speed of 1, so it will only move one space through your canal system. Tip: Be sure you have a captain and a Canal before you complete your ship. These criteria are listed on your Shipyard Board. For each one, advance your counter along the Scoring Track to indicate the points you score. For each Crew Member (including your captain) you score 1 point. You score 2 points for each crane. You score 2 points for each cannon. You score a number of points equal to your ship's speed (as calculated above). Finally it is time for your ship to set sail. Various government officials come to your testing canal to judge your ship's commercial potential, military power, or safety rating. Also of interest is whether your ship might be fast enough to contend for the Blue Riband, the honor given to the fastest trans-Atlantic ocean liner. To test your ship (and score your shakedown points) advance the ship figure through the canal one space for each point of speed your ship has. You must use your ship's full speed. At each space, the figure's stern should indicate where it came from. You cannot move the figure back into a space that it just left. When the figure comes to a confluence, you can choose to advance it along any channel except the one your figure just sailed through. This official gives you 1 point for each soldier and 1 point for each cannon. This official gives you 1 point for each businessman and 1 point for each crane. This official gives you 1 point for each lantern. This official gives you 1 point for each lifeboat. This official gives you 1 point for each lifebuoy. If you land on the same type of official more than once, you get the points each time. However, the Blue Riband spaces work differently. When you get to a Blue Riband space, you score 1 point for each space the ship figure has advanced so far. If your route lands on more than one Blue Riband space, only the last one counts. (So your ship's maximum Blue Riband score is equal to its speed. You score this maximum only if the figure ends the test on a Blue Riband space). This testing is the last step in scoring your ship - for now. 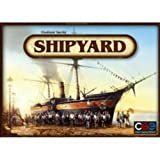 Move your ship (along with its Equipment and Crew) out of your Shipyard. Keep it on the table in front of you, because it might score points again at the end of the game when you reveal your secret Government Contract. The ship figure remains on the space where it stopped. Be sure that its stern indicates which direction it came from. Your next ship's shakedown will start on that space. (If the figure is on a confluence, you do not have to decide which branch it will take until you test your next ship. The bow does not point where your ship must go; it is the stern which points the direction in which your ship can not go). 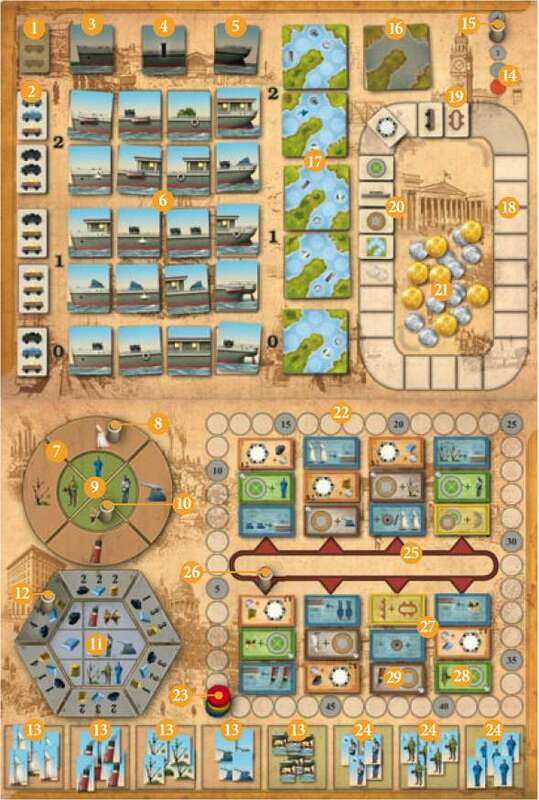 Whenever your ship figure moves onto a new Canal card, the Canal that it just left is removed from your canal system. Keep your used Canals in a stack until the end of the game. (A Government Contract may award points for used Canals. Even if you do not have such a Contract, you should keep your Canals so that the other players think you might). Note: If removing a used Canal causes other Canals to not be attached anymore, then those are removed. They do not count as Canals that you have used, so you should put them in a separate discard pile next to the Canal deck. The only Canals left in your canal system are those that could be reached by your ship figure on future shakedowns. Each time the Action Cards complete a lap around the Action Track, the countdown marker is moved down 1 space. When it gets to the last space , the game is over. 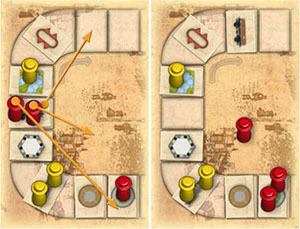 At this point, each player has had one full turn for each of the 23 spaces on the Action Track. The game can end early if you run out of Ship Cards. If the last bow, stern, or middle Ship Card is turned up, the game ends early. Note: Th e deck of middles is in two parts stacked on top of each other. When all the cards in the top part are gone, you have not run out of middles. Just keep filling in spaces with the cards remaining in the deck. It is not possible to run out of anything except Ship Cards. If any other deck runs out, just shuffle the used cards together to make a new deck and keep playing. If you run out of pieces or guilders, find some suitable substitute for them. If the game ends early, keep playing until everyone has had the same number of turns. 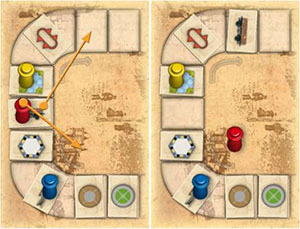 The player on the starting player's right will have the last regular turn. Regardless of which way the game ends, each player gets one final action and one final chance to complete a ship. Beginning with the starting player, each player gets one final action. You can choose from any of them, regardless of whose figures are on them and regardless of what action you chose on your last turn. It is possible for multiple players to choose the same final action. Your final action works the same way it would if you were performing it on step 4 of a regular turn. If your final action completes one or more ships, you take them on a Shakedown Cruise, just as you would on a regular turn. It is not possible to buy a bonus action in addition to your final action. After every player has had a final action, each gets one last chance to complete a ship (beginning with the starting player). If you can not complete a ship with only one card, then you simply pass on to the next player. If you only need one Ship Card to complete a ship, you may buy it in the usual way: Pay the price. Take the card. Slide cards down the column into the empty space. Turn up a new card at the top. Take your completed ship on its Shakedown Cruise and score the points for it. Note: It is still possible to buy Ship Cards (either as a normal Build Ships action or as your last chance to complete a ship) even if there are no cards left . If the type of card you need is no longer available, you can buy that type for free. Use some appropriate substitute to indicate your bow, middle, or stern. A "Ship Card" added to your ship this way has no mounting points, no cabins, and no safety equipment, but it still counts as a Ship Card when calculating the length of your ship. After everyone has had a last chance to complete a ship, all players reveal their Government Contracts and score the indicated points. Some Employee Cards (traders) give bonus points, which should also be scored at this time. The player with the most points wins. Break ties in favor of the player with the most guilders.